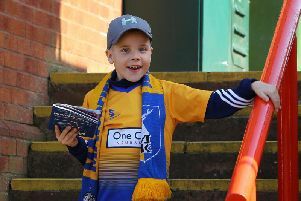 Mansfield Town fans went to the One Call Stadium on Saturday hoping to see the Stags topple high-flying MK Dons. It was a return to their home soil for the Stags after three successive away league matches and they matched the second-placed visitors in a 1-1 draw. Click on the gallery of fans by Steve Flynn to see if you can spot a familiar face.